Becky April 20, 2017 April 25, 2017 1 Comment on Not going back? On Maundy Thursday I finally left my job. I’ve been working from home for the last few months since the Exeter office shut down and spending my last day on my own at home would have been a damp squib, so I decided to go into the Bristol office to have a little company (and attention). I’ve managed to drag out my leaving celebrations. Unlike many people who are made redundant I have known for a long time that this has been coming, plus I was asked to stay on for a few additional months to support the project I had been working on. This gave me plenty of time to anticipate my departure and have a few meals, drinks and parties in various locations around the country. My lovely friends and colleagues treated me to a few gifts and cards and thoughts (some of them taking the mick as I worked through till 3pm). 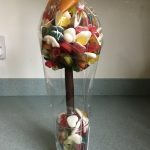 They know what I like and there were plenty of Haribo in the gift bags, including a Haribo pizza and this lovely Haribo tree (which will eventually be devoured -probably all in one go). More practically I also got a MiFi device to allow me to stay on line while we’re away and update this blog. It was a lovely day, but the reality still hasn’t hit home. Give it a few weeks and I’ll finally realise that I’m not going back.